“WebRender isn’t really about making rendering faster. It’s about making it smoother.” A great look at improvements coming to Firefox soon. A collection of CSS snippets to create fast, complex image effects, such as pencil drawing, watercolor painting, and the intriguing ‘flannel’. Which Technologies are Video Developers Using Across the World? 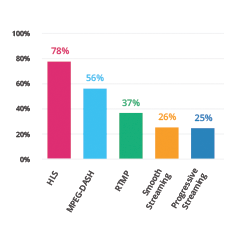 MPEG-DASH or HLS? Cloud encoding or Hardware encoding? HEVC, VP9 or H.264? Find out what developers are using now, and what they will be using in 2018. A deep dive into the latest Bootstrap’s new approach to style resetting, as well as some history of style resets overall. Smashing Magazine ran a CSS Grid design challenge and here are the results. A good look at what’s possible with CSS Grid today. Microsoft Edge is coming to iOS and Android using WebKit on iOS and Blink on Android. A potential future way to increase responsiveness. Creative experiments with arrays of sound and vision. A few nice tips for writing robust and maintainable styles. Get alerts for performance problems and find the bottleneck in your application with end-to-end request tracing.